Ominous text to a degree...let's roll with it. Well folks, it was bound to happen eventually. 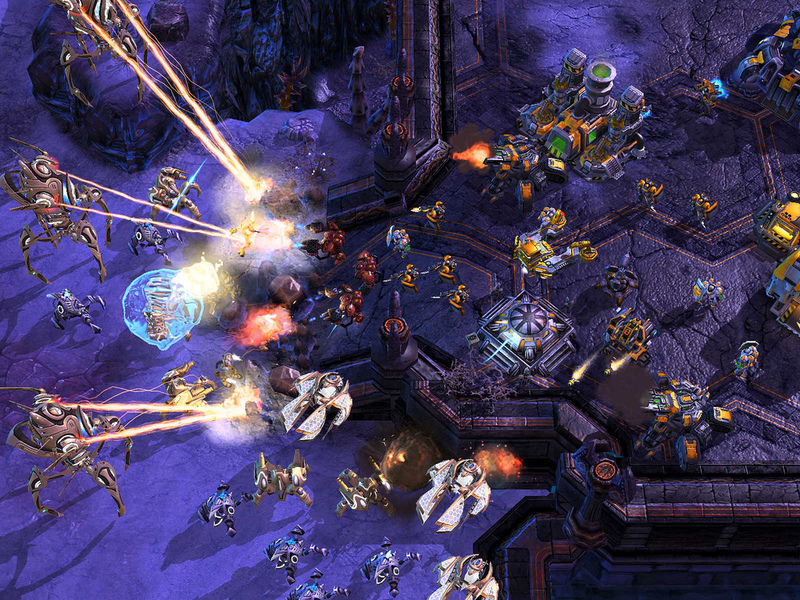 Here’s my coverage of this week’s Game of the Week: Starcraft 2. Heeded as one of the greatest real time strategy games of all time, following predecessors such as Warcraft, Starcraft and Red Alert, Starcraft 2 has improved upon the already complex system of the original. Before I move further with this article, however, allow me to preface it by saying that it has been a while since I’ve played, and I may or may not murder character names…that is all. With an abundance of troops, an interesting storyline, and a major graphic overhaul, Starcraft 2 is definitely a fun game to get into, but I suggest looking elsewhere if you aren’t into it for the multiplayer. While the story is set up well enough, the true playability of this game comes from clicking that ‘find match’ button and improving your micro/macro and overall strategy. I myself was guilty of that initially, but came to embrace (and fear) playing against others to see where I ranked against the rest of the world. In the world of Starcraft, there are three primary races from which to choose and destroy your opponent with. There are the Terran, which are your humanoid race, good with engineering and mechanical things. There are also the Protoss, which are your futuristic cyborg kind of race. Finally, there are the Zerg, which are your hivemind alien type race who exist to pretty much assimilate you into their brood. Now, there has been a lot of debate about which race is strongest in-game, with people regularly getting mad and blaming their losses on the other player’s race. This is wrong to me in a way, as the game feels balanced enough…or maybe I just haven’t logged over one hundred hours of gaming on it yet. Either way, I believe that if someone is having fun, trying to control their ability to have fun isn’t….fun? No…it’s not nice…that’s the word I was looking for. Just like any big game (such as League of Legends that I covered in the previous GotW), there is a large community that isn’t always nice, for lack of a better word. You deal with them like you deal with anyone else you don’t wish to interact with, you ignore it. Anyway, let’s cover the basics. You start with a basic building unit and a couple of worker units that gather supplies for you, you collect ‘minerals’ and later on ‘vespene gas’ to build more buildings, units, and upgrades for said units. Certain units counter other units, while other units counter buildings (banelings seem to counter everything besides air so I don’t count them). It’s a strategic game that makes you focus on multitasking and making sure that nothing is EVER idle…not even for a single second. It takes copious amounts of practice to even get past the early game and proceed into the mid/late game assuming your opponent isn’t a dirty cheeser. Cheesing is pretty much using a rather dirty tactic such as the 6-pool (zerg), the cannon rush (protoss), or the Planetary Fortress rush (terran). Either way it’s a really crappy way to play the game and take the fun out of playing for everyone playing (including the cheeser in my opinion). This game revolves around micro, which is the ability to use your units with pinpoint accuracy, which includes skills such as splitting marines, and macro, which is your ability to utilize your economy to the fullest. A macro intensive game requires you to manage upkeep of your units, watch your unit total (200 if I recall correctly), and generally never let your minerals go above a certain points. A player with good macro can consistently keep his minerals and gas relatively low by creating units continuously, whereas a player with bad macro simply lets his minerals build up. Idle materials aren’t of use to you, so I can see why macro matters. Go to Page 2 to read more!